An experimental offshore floating wind farm project sponsored by the Japanese Ministry of Economy, Trade and Industry has been underway since March 2012. Participating in the project is a consortium comprised of Marubeni (project integrator), the University of Tokyo (technical advisor), Mitsubishi, Mitsubishi Heavy Industries, Japan Marine United, Mitsui Engineering & Shipbuilding, Nippon Steel & Sumitomo Metal, Hitachi, Furukawa Electric, Shimizu, and Mizuho Information & Research. 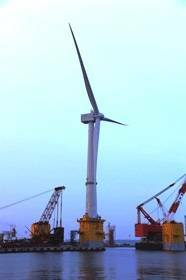 Assembly work on the 7MW oil pressure drive-type wind turbine on the three-column semi-sub floater at Onahama port has been completed, and delivery of the floater to testing area is scheduled to start shortly as part of the second term. Construction work in the second term includes assembly and setting of 7MW oil pressure drive-type and 5MW downwind-type floating wind turbines, delivery of the facilities to the testing area, and connection to the undersea cable. The second term also includes operation and maintenance of the facilities as well as data acquisition and analysis. Work progress to date on the 7MW oil pressure drive-type floating wind turbine has included preceding works such as installation of chains, anchors and undersea cables at the testing area, delivery of the three-column semi-sub floater from Nagasaki to Onahama port, and installation of 7MW oil pressure drive-type floating wind turbine on the floater. As for the 5MW downwind-type floating wind turbine, procurement of chains and anchors, and production of high-voltage riser cable have been successfully completed. Parts procurement and construction of 5MW downwind-type floating wind turbine is in progress. Next for the 7MW oil pressure drive-type floating wind turbine will be the June 30 delivery of the facility from Onahama and its mooring operation in the testing area. Electric work and commissioning is scheduled for mid-September, while the start of demonstration operation is slated for mid-December. Installation of chains and anchors at the testing area for the 5MW downwind-type floating wind turbine will begin in late July. 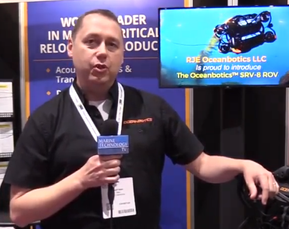 Martin McDonald, an industry veteran with more than 35 years under his belt, is responsible for Oceaneering’s global ROV business. With over 20,000 Doppler products delivered worldwide, Teledyne RD Instruments is the industry’s undisputed leading manufacturer of Acoustic Doppler Current Profilers (ADCPs) for current profiling and wave measurement applications and Doppler Velocity Logs (DVLs) for precision underwater navigation applications. Provides subsea electrical and fiber optic interconnect systems for the harshest environments and at any ocean depth. Wet mateable connectors include signal and high-power electrical, fiber optic, and hybrid electro-optical products all based on patented oil-filled, pressure-balanced technology.